I have the nagging sensation that it’s time to write another blog post even though I have no idea if anyone (other than my daughter and husband) has read the first. No matter; I will persevere! It’s been a little over three weeks and so far, the public response has exceeded ALL expectations. Not in traffic flow…it’s actually crazy quiet in the store for long, lonely stretches (allowing me to write rambling blogs and ample social media posts). But, in sales which, after all, is what matters. We are, in fact, heading out on a buying trip this weekend to boost our depleted stock. People ask every day where we get our vintage inventory. Everywhere, is the answer. Locally, as much as possible but we also like to introduce current looks from other areas. Example: Santa Fe is RICH with Mexican imports! It’s actually, a bit excessive at times.. So, we avoid such things on our journeys. Instead, we look for mid-century modern (which is currently H-O-T), farmhouse-style and timeless, classic designs. But, make no mistake. We LOVE and LIVE FOR the HUNT! If you’ve ever gotten addicted to something: shopping, coffee, vanilla bean frozen yogurt, that nightly glass of Cabernet…you know what I mean. Robin and I both consistently crave the hunt for treasures to sell. Some of the most fun times of my life, which were coincidentally the physically-hardest times due to the nature of what we sell (furniture) have been found at estate sales and flea markets and everywhere in-between. We simply, love it. 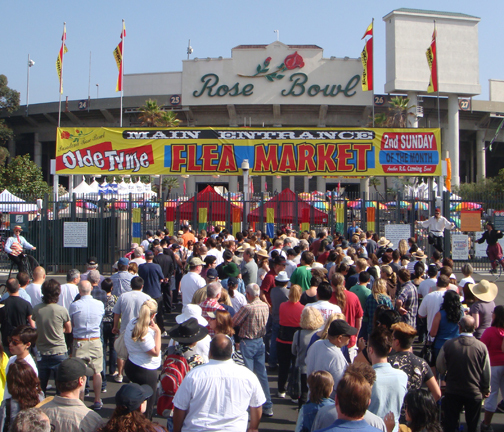 So much so that a few years ago, we moved to L.A. to be closer to the motherland, the Rose Bowl Flea Market. Okay, I’ll admit…our daughter had left home, and our pug of 14 years had passed so that had a lot to do with the necessary change of scenery but also, I just really wanted to go to the source. You know how Muhammad went to the mountain? That was me. I’d been shopping at the Rose Bowl (and yes, many people prefer Roundtop, TX but I don’t enjoy sweating in inappropriate places) several times and it had awed and amazed me to the point that I just couldn’t get it out of my soul. So, we sold most everything we owned, hit the road with a U-Haul and found a place in Altadena, just a few miles UPHILL from Pasadena where the Rose Bowl Flea Market is held on the first Sunday of every month. During the rest of the month, I would walk 3.4 miles around the Rose Bowl and attached golf course, both to keep my girlish figure AND to plot my course. I felt like I really needed to know the lay of the land, if you know what I mean. This is a MASSIVE flea market. Eight hundred vendors on the average that have shopped and hoarded all month to bring their very best wares to the Rose Bowl. While at least 1/3 of it is unordinary: Levi’s jeans, shoes of all varieties, yard sale junk…MOST of it is jaw-droppingly amazing vintage wares at pretty darn good prices. Like I said – the MOTHERLAND. Long story short: it turned out I didn’t need to “know the land like the back of my hand” because I didn’t have a shop. I had nowhere other than our tiny 1-bedroom (plus a BIG closet) to hoard the treasures I found. And after a year in the rat race and smog that is Southern California, we longed to come home to Santa Fe where we could walk most everywhere we go and maybe, someday, afford to open a store. Thankfully, that someday is here. And, next time we travel to the Rose Bowl, they better LOOK OUT because I’ll be prepared!